"It looks like someone had cared about her once, as she was wearing a pink collar with three bells on it, and quite a bit of sparkly bling." Scarcely so much as a fleeting second is able to tick off of the clock of time without a cat somewhere being either horribly abused or killed outright. Lamentably, the overwhelming majority of these dastardly deeds never see the light of day and even those that do are quickly forgotten by a complacent public. Ever so often a case of feline cruelty is uncovered that is so abominable that it is all but impossible to get it out of mind and the abuse that was meted out to a forever nameless gray and white female of undetermined age from Colchester, eighty-two kilometers northeast of London in Essex, most definitely fits into that category. The details are rather sketchy but as best it could be determined somewhere around the beginning of July she was severely beaten about the face by an assailant using either some type of blunt object or perhaps just his fists. Although no specifics of the damage inflicted upon her by the assailant have been publicly disclosed, the bruised and bloodied area around her nose and eye on the left side of her face attest to the severity of the attack. It additionally is entirely conceivable that she could have sustained injuries to other parts of her body, and even internally as well, that are not visible in the photographs that later were taken of her. Her attacker then locked her up inside a blue pet carrier and, presumably, drove her to a location on Easthorpe Road where he stopped and tossed her into a pile of rubbish. He then drove away supremely confident not only that he had fixed her little red wagon once and for all time but that she was going to die a slow and agonizing death to boot. It was a well-thought-out plan that under most circumstances would have come off like clockwork and absolutely no one would have been any the wiser that she once had lived, let alone how that she had died. Events do not always turn out as anticipated even for diabolical cat-haters, however, in that although the cat was battered and bruised, sans food and water, and bedeviled by both insects and the elements, she somehow persevered in her above-ground tomb for the next two to three weeks until an unidentified motorist stopped nearby in order to take some snaps and accidentally overheard her faint cries for help. The photographer eventually spied her cage lying in the middle of a cluster of nettles, bushes, and assorted trash. Whatever slim hope of deliverance that she may have briefly entertained quickly evaporated into the warm July air when that individual callously opted to deliver her up on a silver platter to the knackers at RSPCA as opposed to choosing the far more sensible and compassionate alternative of rushing her to a veterinarian and paying for her emergency care. "She was emaciated beyond belief and looked as if she had been hit around the face before being thrown out of the window," the charity's Samantha Garvey, who came and collected the cat, told the Express of London on July 22nd. (See "Worst Case of Animal Cruelty? 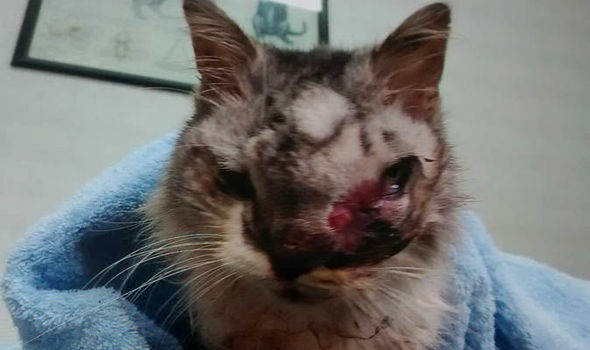 Beaten and Infested with Maggots, Cat Left to Die in Rubbish.") "She was also crawling with maggots." The RSPCA then, predictably, did what it does best. "Sadly, there was nothing which could be done to save this poor cat, she was in such a bad state," Garvey declared. "We took her straight to a vet who said she had to be put to sleep to prevent further suffering." That decision was followed, as per usual, by a proverbial flood of self-serving crocodile tears carefully designed to pull the wool over the eyes of the gullible. "I could barely believe this cat was still alive she was in such a terrible state," Garvey laid it on with a trowel to the Express. "I can honestly say it was one of the most heart-wrenching sights I have ever seen." Considering all the pain and unrelenting torment that the female had been put through and yet somehow had endured for weeks on end, it seems odd that the unidentified sawbones who gave her a quick once-over before pronouncing sentencing would declare that she was unable to withstand a little bit more suffering, especially if it meant sparing her life. The mere fact that she still was able to meow is a pretty strong indication that she wanted to go on living. In hindsight it seems quite obvious that neither the RSPCA nor its designated assassin had the slightest bit of interest in treating her. Rather, they put their diseased, shekel-counting gourds together and conspired to rob her of the one thing that she had left in this world. That is why it is insane for anyone to rat out a cat to the authorities regardless of whether they be rescue groups, veterinarians, Animal Control officers, or the police. Very few of them have any regard whatsoever for the sanctity of feline lives; au contraire, they function primarily as feline disposal services. Garvey also is lying through her rotten teeth when she claims that the cat was beyond all mortal assistance. Actually, there was quite a bit that could have been done for her but that would have required she and her colleagues to stop thinking and behaving like PETA and instead to commit the time, labor, and money that would have been necessary in order to have saved her life. Secondly, Garvey and her veterinarian would have had to quickly gotten over their revulsion at the sight of the maggots. They are, after all, only the larvae of houseflies. The first step in getting rid of the maggots would have been to thoroughly cleanse the cat's wounds and bruises with warm water and soap. An application of hydrogen peroxide would have killed many of those that had burrowed deep into the cat's injuries and a dusting of corn starch would have smothered those that had stubbornly remained on the surface. Vinegar, mint oil, eucalyptus, bay leaves, Drano®, Formula 409®, and various pet shampoos also have proven effective in getting rid of the parasites. Finally, pieces of gauze soaked in turpentine should have been applied to each of the cat's injuries in order to have drawn out those maggots that the soap, hot water, and hydrogen peroxide had failed to kill. These bandages should have been left in situ for up to an hour with a second round of them applied thereafter until all the maggots were completely removed. Once the cat's injuries had been deemed to be free of maggots, they should have been cleaned, antibiotics administered, and then properly dressed. All the while this way taking place, the cat simultaneously should have been placed on an intravenous drip so as to as quickly as possible restore valuable, life-giving fluids to her severely emaciated body. If her body temperature had plummeted, she could have been placed on a heating pad in order to have brought it back up to normal. Whereas there is by no means any guarantee that these measures would have been successful, it is totally inexcusable for the RSPCA not to have given them a try. Not only did the cat deserve as much but if the RSPCA had been successful in saving her life it could have taken pride in having thwarted the evil designs of yet still another cat killer. Even though the question of whether she could have been saved remains unresolved, there can be little doubt that she, at least at one time, did have an owner. "It looks like someone had cared about her once, as she was wearing a pink collar with three bells on it, and quite a bit of sparkly bling," Garvey disclosed to the Express. The next logical question accordingly concerns the whereabouts and behavior of her former owner. For its part, the Express theorizes that her owner abandoned her because either he or she was unwilling to pay for the treatment of her head injuries. While there can be no denying that many owners are too cheap and uncaring to pay for the veterinary care of an injured cat, it also is true that most practitioners have priced their services far beyond the financial reach of the poor and working class. There used to be a time when some veterinarians would allow owners to pay part of their bills upfront and the remainder in installments but those days have gone with the wind. Nowadays, they demand to be paid in full beforehand otherwise they will not treat either an injured or a sick cat. Appealing to their sense of compassion and love of animals is likewise a total waste of time because these cold-blooded mercenaries do not even know the meaning of the former and measure the latter solely in terns of dollars and cents. Besides, in this case cheapness fails to explain the bruises to the cat's face. They possibly could have been incurred when her cage was tossed into the rubble but that does not appear likely. It is conceivable that the cat's owner first beat her but then, belatedly realizing just how much he detested her, decided that killing her was not sufficient and accordingly elected to inflict as much suffering as possible upon her by burying her alive above ground. Owners are, after all, capable of committing some simply atrocious crimes against cats. All things considered, the cat owning fraternity more often than not comes off as smelling more like a rotten potato than a rose. Nevertheless, it is possible that it was not the cat's owner who was responsible for the hideous abuse inflicted upon her. The person who did all of those terrible things to her quite obviously not only wanted her dead but to inflict as much punishment upon her as possible in the process and such antipathy is usually found only in the diseased souls of ornithologists, wildlife biologists, and gardeners. The mere fact that the cat was wearing a collar with bells on it is one indication that her owner may have attempted to dissuade her from chasing birds and other small animals. Also, the fact that she was found in a pet carrier does not necessarily mean that she was put in it and dumped by her owner. For instance, anyone with a few bob in his pocket could have purchased one, baited it with fish, and illegally trapped her. That explanation however in no way accounts for the failure of the cat's owner to come forward and claim her remains. It therefore is conceivable that the owner relocated elsewhere and left the cat behind to fend for herself. 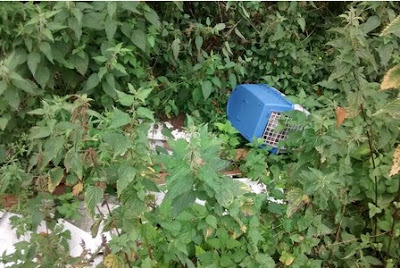 The RSPCA has assumed all along that the cat's emaciation was due solely to its being confined inside the cage for several weeks but that may not necessarily have been the case. Specifically, the cat already could have been on the verge of starvation as the result of living on the street for an extended period of time. Almost as inexcusable as its refusal to treat the cat, the RSPCA's so far has been unwilling to seriously investigate these heinous acts of cruelty. First of all, the charity should have meticulously examined the injuries sustained by the cat in order to determine their extent and how that they were inflicted. Secondly, it should have dusted the pet carrier and the cat's collar for fingerprints. Thirdly, the cat's fur as well as the inside of her cage should have been combed for forensic evidence. Fourthly, the operators of shelters and veterinarians in Essex should have been interviewed and shown photographs of the cat. 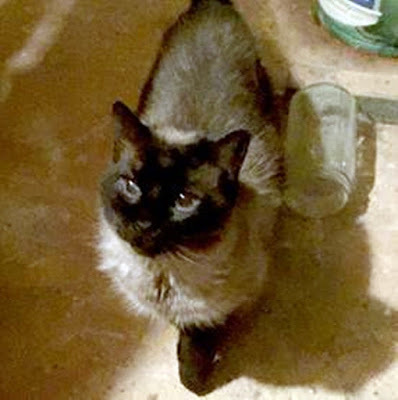 Fifthly, the surrounding neighborhoods should have been canvassed in that it is entirely conceivable that someone in the area either had past dealings with the cat or knows something about her. While passing motorists certainly could not have overheard the cat crying for help, it does seem rather odd that apparently not a single pedestrian noticed its plight, especially given that it was marooned beside the road for so very long. Sixthly, the charity should have checked for an implanted microchip. All of those avenues of inquiry would have been, admittedly, long shots, but the RSPCA is never going to solve a single case of cruelty toward cats unless it first is able to summon the willingness to at least try and in order to do that it must start somewhere. Furthermore, appealing to the public to do its job for it seldom has produced results in the past and therefore is unlikely to do so in this case. So, on and on goes the never-ending cycle of violence and official complicity. Private individuals continue to abuse and kill cats with impunity while groups such as the RSPCA and the veterinary medical profession, whose job it is supposedly to safeguard their lives, not only do absolutely nothing in order to put an end to these heinous acts of cruelty but actually join in the killing themselves. As a consequence, all that the victims' survivors ever receive from both groups are disingenuous declarations of self-righteous moral indignation and a steady stream of incessant appeals for more money coupled with higher veterinary bill. Not surprisingly, there is good money in both rackets, but that is all. Photos: the Herts and Essex Observer of Bishop's Stortford. "Some pieces of his tale remain unanswered but to us Ozzie will always be our Australian traveler who came to our care for a reason." There are numerous missing chapters in his all-too-brief life but even so it is difficult to come to any other conclusion than that the fifteen years that Tigger spent upon this earth could not possibly have been anything other than abject misery. The mere fact that the large and affectionate ginger-colored tom was able to persevere for as long as he did exemplifies both his indomitable spirit and tenacious will to live. As best it could be determined, he was born in Sydney in 1999 and a microchip was implanted in him a year later. 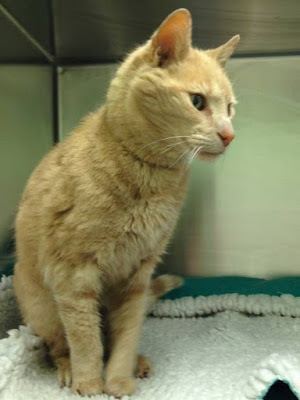 In 2004, he inexplicably turned up as a stray at an unidentified veterinary clinic in London but the practitioners were either unwilling or unable to identify and thus contact his owners. What happened to him after that is a closely guarded secret owing to the surgery's unwillingness to disclose what it did with him. Presumably, the practitioners either fobbed him off on another owner or surrendered him to a shelter but even that is at best conjecture. 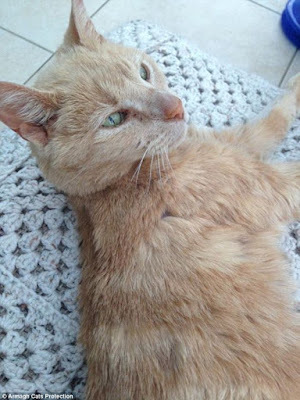 Regardless of the dénouement at the surgery, Tigger somehow managed to live for another eleven years until an unidentified woman in Laurelvale, fifty-six kilometers south of Belfast, telephoned the Armagh Branch of Cats Protection on June 7th in order to rat him out for loitering in her precious little patch of weeds. Quite obviously, she possessed neither the compassion to offer him some food nor the common decency to provide him with shelter and emergency veterinary care. True to its calling, Cats Protection arrived johnny-on-the-spot and immediately took Tigger into custody just as if he were nothing more than a convicted felon on the lam. It then transported him in a cage to the Willow Veterinary Clinic in Portatown, thirty-seven kilometers southwest of Belfast, where he was diagnosed to be suffering from malnutrition. If he was suffering from any other maladies at that time they certainly were not divulged by either Cats Protection or the surgery. Rather, the public debate that followed focused solely upon the information disclosed by the microchip and as a consequence it did not take long before his past life was pieced together in higgledy-piggledy fashion albeit with numerous apertures, omissions, and inaccuracies. Most glaring of all, the charity at first claimed that he had been born in 1989 which would have made him an astounding twenty-six years old. The organization then launched an international appeal on its web site, social media, and through the capitalist press in order to locate his longtime derelict owners in Sydney. "How we wish he could talk," it declared to The Daily Telegraph of Surry Hills in New South Wales on June 18th. 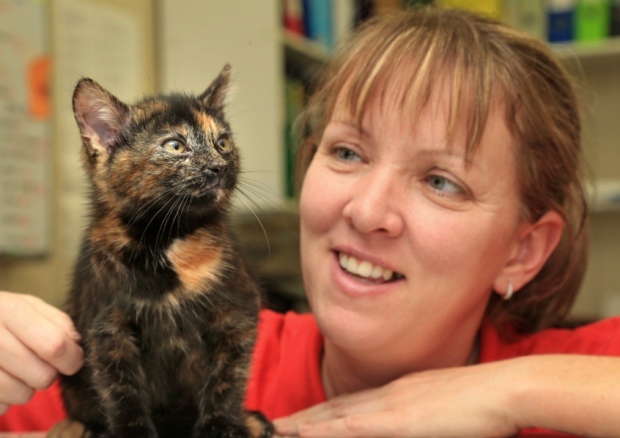 (See "Cat Born in Sydney Turns Up in Northern Ireland Animal Shelter.") "Please share...we would love to solve this puzzle and maybe find his owners." The organization even ventured so far afield as to contact the Royal Agricultural Society (RAS) of Sydney Olympic Park in New South Wales which maintains an animal registry. 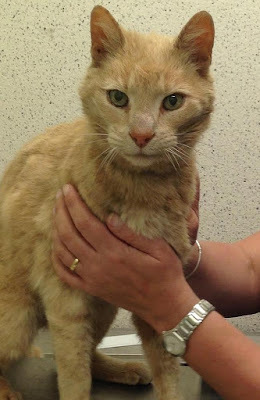 "We are desperate to unravel the rest of this cat's past and hopefully reunite him with his owners," Gillian McMullen of the Armagh Branch told London's Independent on June 18th. (See "The Mystery of the Twenty-Five-Year-Old Australian Cat Which Turned Up in Northern Ireland.") "We have been in touch with the Australian Animal Register (sic) and have our fingers and paws crossed on word from them on this cat." Press reports are contradictory as the amount of cooperation that Cats Protection was able to get out of the RAS. For example, The Daily Telegraph claims that the agency was able to locate Tigger's original owners and that it left a telephone message for them. Such slipshod, slapdash reporting in no way accounts for either how Tigger made it across the Irish Sea from London to Armagh or what, if any, efforts his owners undertook in order to locate him over the course of the intervening eleven years. It also is exceedingly odd that Cats Protection and the RAS were able to accomplish at this late date in Tigger's life what the London surgery was unable to pull off in 2004. Quite obviously, someone is being considerably less than truthful. It additionally is nothing short of reprehensible that Cats Protection would squander so much valuable time and resources in Australia when Tigger had not only been living in the United Kingdom for such an extended period of time but until fairly recently apparently also had a known, but not publicly identified, guardian somewhere in County Armagh. "The poor cat was starving but obviously had been cared for in the past because it was wearing a collar," McMullen conceded to The Daily Telegraph in the article cited supra. As things eventually turned out, UTV had it all wrong in that Tigger's original owners never made good on their pledge to come to Armagh and collect him. Plus, nothing further ever was reported concerning either the identity or the intentions of his recent owner in Armagh. That left him at the mercy of Cats Protection and it certainly did not waste any time in lowering the boom on him. "Sadly his health has deteriorated and he is in kidney failure," the charity confirmed to the Daily Mail on July 1st. (See "Globetrotting Aussie Cat Found in Ireland (sic) Is Spending His Last Days in a Cat Shelter after Being Diagnosed with Kidney Failure.") "He is spending his last days with us and when the time comes it will end in dignity surrounded by love." When it comes to killing cats the charity certainly means what it says and is not to be trifled with and as a direct consequence Tigger was dead by July 6th. "We were really hoping for a happy end to his story, but he had developed serious and untreatable kidney failure. In the end it proved too much for him and he was very weak and ill," McMullen claimed in a July 6th press release. (See "Dignified End for Globetrotting Puss Ozzie.") "It was heartbreaking when the vet said the only thing we could do was to have him put to sleep. In the end, he died peacefully and quietly in my arms." For starters, only a homicidal maniac ever could find any dignity in the cold-blooded murder of a cat. Secondly, although Cats Protection has not disclosed what was done with his remains, it more than likely casually tossed them out in the trash and it likewise is utterly impossible to find any dignity in such rank callousness. "He was fifteen and had clearly led a very colorful and eventful life," McMullen further declared as an additional rationale for snuffing out his life. Like her argument about dignity, this is simply more self-serving sottise. As if all of that palaver were not dishonest enough, either she or one of her colleagues had the unmitigated gall to slyly invoke divine providence as yet still another justification for killing Tigger. "Some pieces of his tale remain unanswered but to us Ozzie will always be our Australian traveler who came to our care for a reason," the charity pontificated to the Daily Mail in the article cited supra. First of all, Tigger did not come to Cats Protection voluntarily but rather was forcibly abducted from the street and shanghaied onto death row. Most important of all, it is extremely doubtful that either the gods or The Fates authorized his death and gave Cats Protection the right to kill him. To engage in such patently bogus rationalizations is not only dishonest but insufferable as well. Like all cat killers, Cats Protection must accept responsibility for its own actions and stop fobbing off the blame for its despicable crimes on supernatural powers. On a more practical level, it is strikingly peculiar that Tigger was able to somehow persevere for so long on his own but once Cats Protection got its hands on him he suddenly was deemed to no longer be fit to go on living. A very similar set of circumstances befell a sixteen-year-old homeless cat named Marvin from Half Moon Bay, California, in August of 2011. In that light it would be helpful to know exactly when Willow Veterinary Clinic arrived at its conclusion that he was suffering from irreversible kidney failure and what, if any, measures were undertaken in order to treat him. As for the malady itself, its onset has been attributed to almost anything and everything excluding the kitchen sink. For instance, it has been linked to, inter alia, the Feline Leukemia Virus (FeLv), the Feline Immunosuppression Virus (FIV), abdominal trauma, genetic defects, urinary tract obstructions, hypertension, Feline Hyperthyroidism caused by exposure to polybrominated diphenyl ethers (PBDEs) and other toxins in the home, diabetes, and inbreeding. Researchers at Colorado State University have found a troubling link between it and the vaccinations for Feline Viral Rhinotracheitis (herpes), the Feline Calcivirus (pneumonia), and Panleukopenia (distemper). Although any one of those factors could have prompted Tigger's kidneys to fail, it additionally is conceivable that conditions at Cats Protection's shelter in Armagh could have exacerbated some underlying health issue that he may have had prior to his unjust arrest and incarceration. Regardless of the cause, the organization's terse announcement on July 1st that it was planning on killing him came as a coup de foudre. It also cannot be completely ruled out that he was liquidated, not because he was too sick to go on living, but rather due to financial considerations. That is because Cats Protection was not about to pony up for either his extended care or his treatment and, presumably, the same was true for his unidentified guardian in Armagh. By default that left matters in the hands of his original owners in Australia who, because of their ability to travel the big, wide world, quite obviously have money to burn. When they, predictably, refused to come to Tigger's rescue, Cats Protection wasted no time in getting rid of him. Although that analysis of events is, admittedly, pure supposition, it at least has the advantage of being buttressed by the well-known fact that kidney failure in cats is no longer a coup de grâce. Au contraire, it quite often can be successfully treated with dialysis, diuresis, renal replacement therapy, and chemotherapy but doing so is not only expensive but labor intensive as well. The best news, however, is that many cats do not need to go through all of that torture but rather their lives can be saved through the daily administration of subcutaneous fluids and by placing them on special diets. "I've seen even very sick cats, cats who need hospitalization in the beginning, do really well on home care with an owner who was willing to give it a try," Miami veterinarian Patty Khuly told the San Francisco Chronicle on August 18, 2009. (See "Caring for a Cat Whose Kidneys Have Failed.") "What makes the difference in how well a cat with kidney failure does is not how sick they (sic) are, or how bad their kidney values are on a blood test. It is the attitude of the owner." The benefits to be derived from home care are not necessarily of a transitory nature either. "Many of these cats who are on the brink of death can be brought back with supportive care at home," Khuly added to the Chronicle. "Not only brought back for days or weeks or months, but years. You just don't know unless you try." Although the specifics of Tigger's disease have not been made public, there can be little doubt that he was killed solely because he did not have anyone in his corner who cared enough about him to even so much as to attempt to save his life. Otherwise, he very well might still be alive today. It is a subject that is not discussed all that much but caring for a large number of felines, as Cats Protection does every day of the year, invariably leads to certain amount of institutionalized callousness whereby saving individual lives is more often than not sacrificed upon the utilitarian altar of doing the most good for the greatest number. Under such harried and parsimonious circumstances, it is difficult for questions of morality and compassion to receive anything other than short shrift, that is, if they receive any consideration whatsoever. Regrettably, shelters make dozens, if not indeed hundreds, of these life and death decisions every day of the week. The only difference is that the tens of thousands of cats that they so callously sell down the river in the name of expediency and with hardly so much as a second thought never find their way, like Tigger, into public consciousness. The operate under such a philosophy is not only morally indefensible but dishonest as well in that Cats Protection sans doute reaped a windfall in terms of the donations that poured in from the public in order to relieve Tigger's plight. By killing him off while simultaneously holding on to those donations the charity is guilty of defrauding the public and as such should be held accountable under the consumer fraud statutes. Furthermore, the killing of Tigger is far from being the only skeleton in Cats Protection's commodious and spidery closet. For example, in 2005 it got greedy and began depositing its money in an Icelandic bank known as Kaupthing Singer and Friedlander (KSF). The heady times and high interest rates that KSF promised the charity came to a crashing halt in 2008 when it went bankrupt. As a result, Cats Protection lost £11.2 million and that resulted in eighty of its employees losing their jobs. In 2013, the charity's branch in Moray flimflammed twenty-nine-year-old Suzi Gallacher of Elgin, two-hundred-eighty kilometers north of Edinburgh, out of a cat named Bramble that she earlier had adopted from it. In particular, representatives of the organization seized it under the pretense of taking it to a veterinarian only to later leave Gallacher a message stating that Bramble had been reclaimed because she had allowed it out into her garden. In January of this year the charity presented to Parliament its Manifesto for Cats and although eight of its proposals are rather commendable the remaining two, if adopted by the legislators, would be disastrous for the species. In particular, the organization's call for the establishment of a national database in order to keep track of all cats would undoubtedly lead to the senseless killing of thousands of foreign cats who illegally enter the United Kingdom each year. Cats who through absolutely no fault of their own are stolen, become lost in transit, and wind up trapped inside vehicles and shipments of merchandise are all the time finding themselves in dutch with immigration authorities and instead of placing bounties on their tiny heads and issuing death sentences they should be afforded all the prevailing rights and privileges that are enjoyed by their counterparts who are legal residents. Any other approach is cruel and utterly barbaric. It is by no means clear how this proposal would have affected Tigger if it had been in situ in either 2004 or 2015. Nevertheless, it does not take a genius to realize that a cat without a loving and caring guardian in order to shelter and protect it is already up the spout and to have immigration officials aligned against it as well makes for a totally unwinnable situation that, barring a miracle, can only lead to its demise. Moreover, if Cats Protection and its flatheaded allies within the political establishment are allowed to prevail, pretty soon no cat will be able to take so much as a bleeding piss without first receiving written permission from the queen, MI5, and the local water commissioner! The mere fact that such bureaucratic and veterinary chicanery is being used in order to make money and to kill innocent cats makes it all the more deplorable. The charity' second ludicrous proposal calls for the mandatory microchipping of all cats. "It is only because of a microchip that we were able to identify Ozzie," McMullen caroled in the Armagh Branch's July 6th press release cited supra. "But as his case highlights, it's really important to keep the details up-to-date." Au contraire, Tigger carried around inside of him a microchip for fourteen long and trying years and there is not so much as a solitary shred of evidence that he in any way benefited from its presence. Other than piquing Cats Protection's undying lust for money, the only thing of value that it revealed was the callousness of his Australian owners and the careless and irresponsible practices of the London surgery. The chip additionally did him a great disservice in that without it Cats Protection never would have been tempted to embark upon a wild goose chase to Australia. It also easily could have gotten him either killed on the spot or deported. As if all of that were not horrendous enough, Katherine Moseby and her colleagues at the University of Adelaide are in the process of developing toxic microchips that are designed to kill cats. The chips are to be implanted, not in cats, but rather in those species fawned on by the eggheads and their political paymasters. As Jean-Jacques Rousseau pointed out in his 1750 treatise, Discours sur les sciences et les arts, precious little good ever has been derived from the cultivation and spread of knowledge and technology. That is due principally to the fact that the benefits of such advancements are almost always monopolized by the evil people in this world in order to augment their power at the expense of others, the animals, Mother Earth and, above all, the truth. "Progress is the destruction of the real world in favor of a technology that creates a comfortable way of life for a few fortunately situated people," is how Native American scholar Vine Deloria Jr. would later put it. The remainder of creation accordingly would have been far better off if man had remained relegated to the pre-Promethean state described by Aeschylus in his play, Prometheus Bound, where he was without arts and hope and knew only that death was before him. It even could be argued with some force that Prometheus should have allowed Zeus to destroy the entire human race. Whereas that is a debatable point, there cannot be any denying that man has grown too big for his breeches and that Zeus may yet be forced to intervene and, as Aristophanes maintains in Plato's Symposium, once again chop him in two. No additional details have been provided, however, and that makes it all but impossible to corroborate the charity's claim. The best therefore that can be hoped for is that she has not received the same "dignified end" that it gave Tigger. At about the same time that Pops was exiting its Midsomer Norton and Radstock branch, the charity's shelter in Armagh was welcoming a nameless young kitten that had been rescued in early August from the M1 in Lurgan, twenty-nine kilometers south of Belfast, by the Police Service of Northern Ireland (PSNI). Looking back over the course of Tigger's turbulent and distressful life it is impossible to find anything even remotely constructive to say about any of the dozens of individuals and institutions that sashayed into and out of his world. His life and, especially, his death therefore constitute a staggering indictment of both the callousness and malfeasance of the entire god-rotten lot of them. Most inexcusable of all was the shameless behavior of Cats Protection which had at its disposal the veterinary expertise, manpower, and money in order to have saved his life but instead voluntarily chose to commit the cardinal sin of doing the exact opposite. Considering all the trials and tribulations that he had been put through, he richly deserved every chance in the world to have gone on living but the only things that he received in return from the charity were perfidy, a feast of self-serving sophistry and, finally, a lethal jab of sodium pentobarbital. It also never must be overlooked that Cats Protection, whether for either financial or xenophobic reasons, wanted to deport him to his doom when it would have been much easier for it to have found him a sugar daddy in Armagh. That was, after all, the only way that his life could have been spared. Secondly, the London surgery that failed to contact his owners, to update his microchip database, and to disclose to the public what it ultimately did with him, should not only be publicly identified but selected as well as the poster clinic for the entire veterinary medical profession. 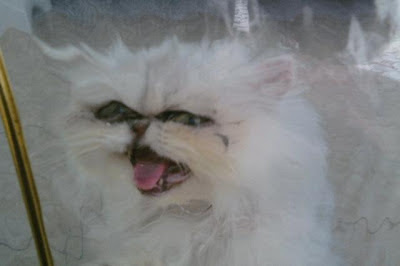 Once the huge number of cats that practitioners all over the globe deliberately kill each year, their outrageous incompetence, and the incalculable number of sick and injured animals that they send to their premature graves because of the exorbitant fees that they demand is taken into consideration, the picture of them that emerges is that of a thoroughly unprincipled criminal gang of cutthroat mercenaries who, outrageously, have appropriated for themselves the exclusive right to determine which animals are going to be allowed to continue living and at what price. To put the matter succinctly, they look down their crooked noses at cats as being little more than the expensive playthings of the bourgeoisie and the rich. At no time are any considerations of either morality or compassion allowed to enter into the desiccated recesses of their shriveled gourds. Even more disturbing, since few, if any, complaints are ever voiced against the profession and how it conducts business, the general public surely must be every bit as morally bankrupt. Regardless of how widespread the selfishness and callousness may be, that does not alter the salient fact that affordable pet care is every bit as fundamental to the proper functioning of a civilized and compassionate society as is health care and for those individuals and groups who supposedly care about cats to allow veterinarians to continue to get away unscathed with their multitude of crimes speaks volumes for their lack of commitment to those whose cause they proclaim to champion. Ever once in a blue moon a practitioner will make headlines by treating an impecunious cat but it is all for show and donations; worst still, absolutely nobody on the planet cares enough in order to investigate and disclose the desperate plight of the thousands of suffering animals to whom veterinarians turn deaf ears and hardened hearts. To put the entire sorry matter in a neat little nutshell, the practice of veterinary medicine is on a par with that of operating either an animal research laboratory or an abattoir. Besides the uncaring and irresponsible conduct of his recent guardian in Armagh and the downright hostile reception that he received from the woman in Laurelvale, Tigger suffered the greatest amount of abuse at the hands of his original caretakers in Sydney. Not only did they shamelessly run out on him in 2004 but they left him marooned in a foreign land to boot. There is absolutely nothing in the public record that would even hint at the remote possibility that they either cared so much as one whit about his welfare or that they undertook any efforts whatsoever to locate him. Having failed to learn a blessed thing from their past mistakes, they likewise gave him the cold shoulder back in June when he needed them the most. Their errors of both omission and commission predate all of those offenses, however, and actually began when they initially decided to drag him all around the world with them. As an old Sprichwort stipulates, dogs belong to people but cats belong to places and as such traveling with them is, under most circumstances, not a good idea. On top of all of that, the legal restrictions placed upon cats that unwittingly venture across international frontiers are simply too onerous, expensive, and unwieldy, not to mention dangerous, as to make traveling with them a worthwhile experience. All of those factors combine to severely limit the options of owners who also like to see the world. The only real solution is to leave them in their own houses with a family member who has graciously elected not to travel. Pet sitters are, generally speaking, not a good idea because cats require almost constant supervision. Boarding kennels are rife with disease and cat hotels are just too expensive. Private yachts and jets are possible alternatives for those who want to take their cats along with them as they see the world but even they need to be wary of the machinations of immigration and customs officials. The vast majority of individuals soon realize, however, that owing cats, like having children, changes everything and as a consequence prior foreign adventures are destined to become only fond memories that never are to be repeated. In spite of that myriad of daunting impediments, some individuals stubbornly insist upon leaving their beloved companions behind and hitting the road. 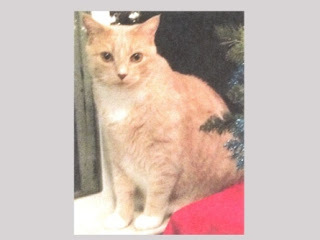 For instance in May of 2013, Alex McAllaster of Fort Walton Beach went on a six-week sailing trip and in doing so left behind her beloved cat, Dante, with an unidentified roommate. She did that in spite of the fact that Dante, whom she had owned for eight years, is afflicted with a bladder condition that prevents him from consuming dry food. When she returned home in late June she was horrified to learn that almost as soon as she was out the door her roommate had dumped Dante on a stranger that she had met in the parking lot of Sam's Club. Thanks to a fortunate tip from a public-spirited citizen, McAllaster finally was able to relocate Dante on June 29th. In conclusion, it is difficult to fully comprehend the depth of the fears and deprivations that Tigger experienced as he was bandied about from Sydney to London and on to Armagh. All that can be said with any degree of certainly is that no cat ever should be so continuously uprooted, deserted, betrayed, and left to fend for himself in a world that even on its best days most closely resembles a nest of wipers as far as members of the species are concerned. The mud and manure on the cake was, however, Cats Protection's unforgivable decision to kill, rather than to treat, him. Things could have turned out so very differently for him if only one person had cared just a tiny bit about him but not so much as an ounce of love was to be found anywhere along the wide expanse that separates Australia from Northern Ireland. All that is left of him now are the photographs and the memories. It is difficult, however, to refrain from speculating on what it was that sustained him throughout all of his lonely and utterly terrifying perambulations. "Oh, weary, weary hour! Oh haggard mind, groping darkly through the past; incapable of detaching itself from the miserable present, dragging its heavy chain of care through imaginary feasts and revels, and scenes of awful pomp; seeking but a moment's rest among the long-forgotten haunts of childhood, and the resorts of yesterday; and dimly finding fear and horror everywhere! Oh, weary, weary hour! What were the wanderings of Cain to these!" So, too, was it the case with noble Tigger, the cat who, sadly, never counted for very much of anything with anyone. Photos: Cats Protection (Tigger), PSNI (kitten), and the Northwest Florida Daily News (Dante). "If only cats could talk I feel Pops probably has a very sad story to tell. It would be lovely to give her the happy ending she deserves." The complexities and difficulties that accompany the sacred gift of life are, at times, so overwhelming as to almost negate the value of the bequest itself and that is especially the case when it comes to coping with the frailties and insecurities that bedevil the twilight years. Elderly men and women at least have their families, pensions, and health care plans in order to help them navigate through their last days but very old cats seldom have any of those advantages. Abandoned to their own devices, penniless, and with their health rapidly on the decline, they are totally dependent upon the kindness of strangers for their continued existence. Revoltingly, the only consideration that the overwhelming majority of them ever receive from the hoi polloi is benign neglect and just about all shelters and veterinarians kill them on sight. Nevertheless, in spite of the odds being stacked so heavily against them a few of these senior felines not only manage to persevere but to find a measure of both meaning and happiness in their final years. "For every age is fed on illusions, lest men should renounce life and the human race come to an end," Joe Conrad observed in his 1915 novel, Victory, and perhaps cats also have unfathomable illusions of their own that keep them going and thus prevent them from throwing in the towel early. In the final analysis, it really does not make any difference what it is that motivates them to cling so tenaciously to life as long as their inalienable right to it is respected. 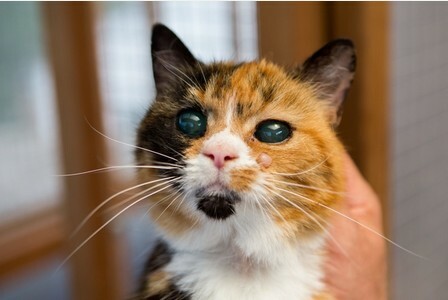 That pretty much defines the precarious predicament that a lovely nineteen-year-old tortoiseshell erroneously dubbed Pops now finds herself in as her fragile life hangs in the balance at Cats Protection's Midsomer Norton and Radstock shelter near Bath in Somerset. She was found dazed and stumbling alongside a road, presumably somewhere near Bath, back in May by a Good Samaritan who, mistakenly believing her to be ill, rushed her to a veterinarian. Thankfully, that was not the case but the ravages of old age have left her almost completely blind in both eyes, unsteady on her feet, and with fur that easily becomes matted. 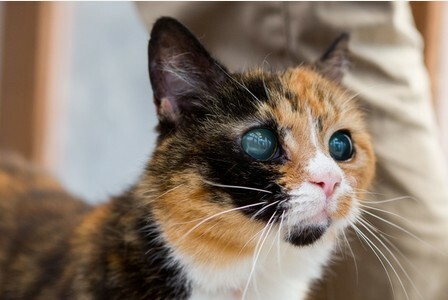 Every bit as heartbreaking and disgusting at the same time, the supposedly cat-loving English public does not want any part of her and for that reason she has been cruelly left to languish at Cats Protection's penitentiary for nearly three months. Her profile has been viewed more than five-hundred times on the charity's Facebook page and an undisclosed number of times on Animal Search UK but all those gawkers apparently have hearts that are even colder than those alleged to belong to whores. The holdup seems to be that the light has all but gone out of her eyes and that in turn gives her a disquieting countenance. 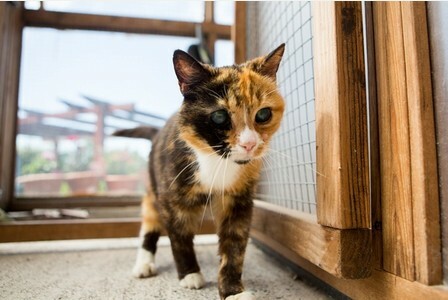 "I think because of her sight and health problems she isn't everyone's first choice," Belinda Dark of Cats Protection told the Western Daily Press of Bristol on July 14th. (See "United Kingdom's Oldest Rescue Cat Pops, Nineteen, Can't Find Home Due to Terrifying Eyes.") "Her appearance isn't as favorable as some of the younger kittens. I think people are put off (by her) eyes or how frail she is." For so many fans of the species to turn up their dirty noses at an elderly feline in extremis does not reflect favorably upon the cat-owning fraternity. Aside from their appalling lack of compassion, such callous behavior additionally reveals their abysmal lack of intelligence. That is because an elderly cat is every bit as valuable and has just as much to give as a young one. "She was very confused when she came to us," Dark added to the Western Daily Press. 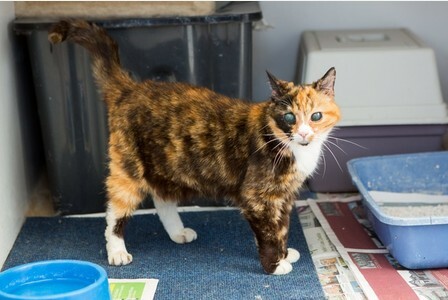 "Her sight is very poor and she is a weak old cat but she loves being close to you and being petted. She's incredibly friendly and doing well for her age." Although in all likelihood Pops is not going to be around very much longer, every moment spent with her would be something to be treasured and that alone would more than compensate for both her adoption fee and the minimal cost of caring for her. Plus, once again having a loving home would mean so much to her. "If only cats could talk I feel Pops probably has a very sad story to tell," Dark speculated to the Western Daily Press. "It would be lovely to give her the happy ending she deserves." In that light, absolutely nothing about Pops' past life has come to light so far and it accordingly is not known how that she ultimately wound up on the street. For her part, Dark is of the opinion that she previously was owned by an elderly individual who either died or became incapacitated in some fashion and therefore could no longer care for her. The fact that no one so far has come forward in order to reclaim her tends to lend a certain amount of credence to that supposition. It also is conceivable that she was deliberately abandoned. For example, a Ragdoll-Siamese-mix of undetermined age named Isabelle was left all alone in an unoccupied house in Stockbridge, thirty-five kilometers south of Atlanta, for an astounding two years after her unidentified guardian died. The shameless relatives gladly took in the dogs that had been left behind but they wanted no part of Isabelle. The future looked rather bleak for Isabelle until she was taken in by Furkids of Atlanta which claims to have placed her in a new home during the first week of July. Inexplicably, no mention of either her or her new guardian could be found on either the organization's web site or its Facebook page. As far as it could be determined, none of the relatives ever was charged with either abandonment or animal cruelty. There cannot be any denying, however, that the past two years must have been an exceedingly difficult and harrowing time for Isabelle. At least she survived both home arrest and solitary confinement and that is considerably more than can be said for a nine-year-old white Persian named Tavia who was left all alone for two months in an unheated house in Kissimmee, Florida, during the fall of 2010 by a holy roller who bills herself as Prophetess Royal Poinciana Sprewell. Although Tavia was periodically supplied with food and water, she nevertheless was found dead on December 6th and a necropsy later revealed that she had died of hepatitis and kidney failure. Even though Sprewell makes a mint at the expense of those in search of an eternal home upon high, she inexplicably had fallen behind on both her rent and the electrical bill and for that reason she elected to skip out on Tavia. She she did retain the keys to the house, however, and thus was able to continue feeding her. Even more outrageously, although Osceola County Animal Control (OCAS), the Kissimmee Police, the Osceola County Sheriff's Office, neighbor Santiago Sandoval, and likely the landlord as well were fully cognizant of Tavia's rapidly deteriorating health, all of them categorically refused to come to her aid and instead stood idly by like rubberneckers at a train wreck and watched her die by degrees a slow and agonizing death. Afterwards, Sprewell had the audacity to claim that Tavia had died of loneliness and Lee Radevaugh of OCAC, desperate for any excuse to absolve his agency's malfeasance, opportunistically concurred with her. As a consequence she, like Isabelle's caretakers, never was charged with animal cruelty. Although feline homelessness is well documented, it might surprise some to learn that nearly ten per cent of the cats currently incarcerated at the thirty-one shelters operated by Cats Protection throughout the United Kingdom are at least eleven years old. Even more troubling, it takes the charity five times longer on the average to find homes for them than it does for kittens to be adopted. During kitten season, which runs from April to September, that differential grows to six and one-half times. "During the spring-summer months we see a dramatic rise in kittens being adopted instead of older cats (and) it can be horribly sad to see them left behind," Dark confessed to the Western Daily Press. "I think often older cats get a little overlooked, much like secondhand items, but ultimately there is just as much joy in rehoming an older cat as there is a kitten." The wholesale neglect and abuse visited upon elderly cats is perhaps nowhere more vividly demonstrated than in Dark's offhand admission that before the arrival of Pops she never had taken in a cat that was older than fourteen. That would tend to imply that other than those that die natural deaths, the remainder are either whacked by unscrupulous veterinarians at the behest of their equally culpable owners or are unconscionably abandoned, like Pops, to fend for themselves in an extremely hostile world. There certainly is not any shortage of extremely old and footloose cats. For instance, in May of last year a twenty-year-old brown and white male was found by another Good Samaritan in Prescott, thirteen kilometers east of Liverpool, in Merseyside. Dubbed the Hobo Cat, he was taken to the RSPCA where an implanted microchip revealed not only his age but that he had been adopted from Cats Protection way back in 1994. He also had apparently resided for an unspecified period of time in St. Helens, six kilometers removed from Prescott, and also in Merseyside. 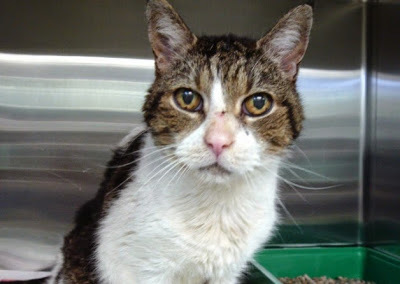 "Unfortunately he is a bit poorly at the moment so he is being treated in one of our clinics but his issues all relate to old age," Derek Hampson of the RSPCA acknowledged to The St. Helens Reporter on May 16, 2014. (See "The Oldest Hobo? Cat Aged Twenty Living as Stray.") "He is such an old chap we would love to be able to reunite him with his owner and to get him home where he belongs." Regrettably, it has not been possible to determine what eventually became of him. His only obvious hope of salvation rested in his previous owner coming forward and reclaiming him in that it would be out of character for the RSPCA to be willing to foot the bill for his extended care. Many of the same fears pertain to Pops in that if she is not adopted soon Cats Protection will eventually decide to snuff out her life also. The organization will never admit to committing such an atrocity but instead it will dredge up some nonexistent malady in order to justify getting rid of her. It also is a bit disconcerting that the charity would commit the glaring faux pas of mistaking Pops to be a male when 99.96 per cent of all tortoiseshells are females. That equates to only one out of every four-hundred-thousand of them being males. Despite their rarity, about two male tortoiseshells are born in England each year. 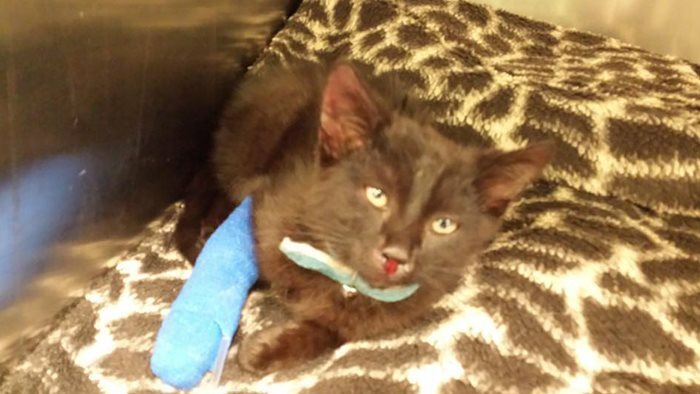 For instance, a twelve-week-old kitten named Harry was unwittingly surrendered to Lothian Cat Rescue in Bonnyrigg, thirteen kilometers southeast of Edinburgh, on November 14th of last year because his owners were allergic to his fur. Even the veterinarian who first examined him committed the same mistake as Cats Protection did with Pops. "When I heard the cat was called Harry, I said to the owners (sic), 'I think that might have to be Harriet'," Margaret Riddell of ICR Veterinary Surgery in Gorebridge, three kilometers to the south of Bonnyrigg, told the Edinburgh Evening News on November 19, 2014. (See "One of the World's Rarest Cats Given to Rescue Center.") "I had to change my words when I discovered it was male. I've never seen one before and I've been a vet for more than thirty years." That is a rather unflattering revelation for her to make in that the practice of veterinary medicine should be based upon knowledge, observation, and diagnostic testing as opposed to prejudice, false assumptions, and guess work. It also is an additional piece of evidence in support of the proposition that the only thing that some practitioners care about when it comes to treating cats is how much money that they can get out of their owners. As far as Pops is concerned, the first order of business is to put pressure on Cats Protection in order to dissuade it from taking the easy and cheap way out by killing her. Secondly, a home must be found for her and as soon as possible. Thirdly, she needs a proper name. In furtherance of that worthy objective, Grandmother, Dowager, Survivor, and even Lady Hope would do just fine. Anyone either willing to provide Pops with a loving home or to urge Cats Protection to spare her life is strongly encouraged to do so by contacting the organization's Midsomer Norton and Radstock branch at 44-01761 410594. Photos: Western Daily Press (Pops), The Examiner (Isabelle), Santiago Sandoval (Tavia), St. Helens Reporter (Hobo Cat), and Gordon Fraser of the Edinburgh Evening News (Harry and Zelent).